"Oo, nagmakaawa ako! Pinilit ko sarili ko na maging part ng pelikula. Ok na?" 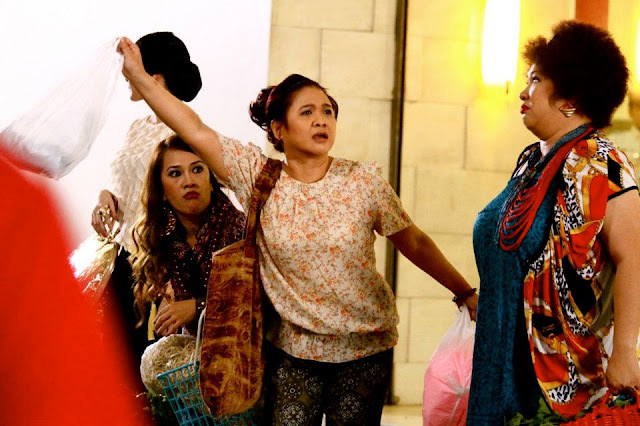 The charming Eugene Domingo tried to make everything humorous albeit the situation calling her to stand and defend herself. 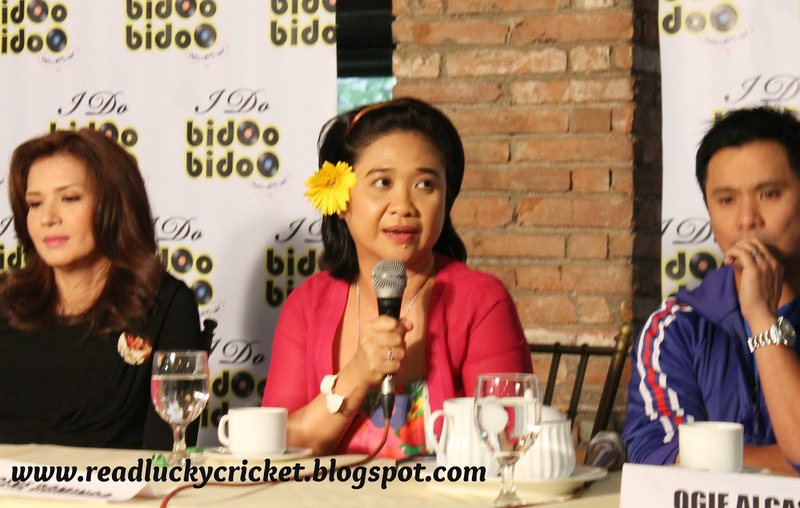 She worked it out and the presscon continued seamlessly after she was asked an intriguing question by a member of the media during the "I Do Bidoo Bidoo" press conference held at Annabel's Restaurant in Quezon City last August 4. It was a very interesting question but no one dared to ask the Philippines' most in demand actress today. Not after the first hour of the question and answer portion atleast. She smiled and joked about her "kilig" feelings to be onscreen, for the first time, with the "Pure Energy" whom she fondly call "Sir Gary (Valenciano)" and talked about her love scenes with Ogie Alcasid. Among the two top vocal performers, completing the senior major cast of the film is Eugene and the Divine Diva herself, Zsa Zsa Padilla. They are all celebrities in their own rights but it was obvious that Eugene was the only one who is not into music- as far as the general public know. And "I Do Bidoo Bidoo" is a musical. As the microphone was passed around to accommodate the last 2 questions, everyone seemed to be contented by the flow of discussion. Everyone seemed to get their choices of angle to write. But one brave soul blurted out his gut. 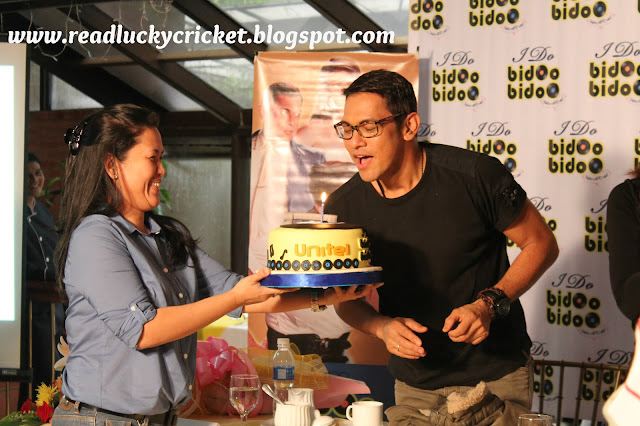 "Dahil ba bestfriend mo si Direk Chris (Martinez) at ikaw na 'yung kinuha for the role? Bakit kaya hindi si Songbird, for example? ", the media person who is connected to a top circulating tabloid, asked. "Busy si Songbird! OK?! Busy silang lahat! ", Eugene joked. "Lahat sila mga singers. Bakit sayo napunta ang role? ", the media person continued asking. "Oo, nagmakaawa ako! Pinilit ko sarili ko na maging part ng pelikula. Ok na? Para lang may maisulat ka. ", Domingo explained in a tone that she herself will brand, basing on "Ang Babae sa Septic Tank", as "TV Patrol Acting". The rest of the members of the press laughed. But of course you will feel that Eugene and the rest of the cast were not really OK with it. Zsa Zsa Padilla saved Eugene. "Ikaw naman (name of media person). Infairness naman to Eugene she have the credentials for this movie. Bakit mo naman siya nilaglag", Zsa Zsa said. 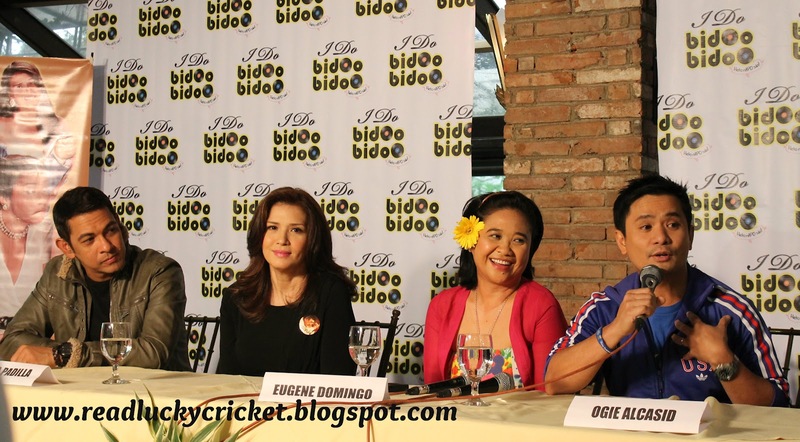 The presscon concluded on a lighter note though. That could be credited to Eugene's capability to turn all things positive- an element that transformed her from being Ai Ai Delas Alas's support into the Kimmy Dora we all love who broke indie box office records and won an Asian Film award for "Ang Babae sa Septic Tank". Now she will try to be, once again, the talk of the town as she plunged into her first musical role in Unitel Productions' "I Do Bidoo Bidoo". With Eugene in this film, as mentioned before, are powerhouse musical cast of Gary Valenciano, Ogie Alcasid and Zsa Zsa Padilla. The younger generation commissioned to lead the film are Sam Concepcion and Tippy Dos Santos, who are both fresh from the successful run of their stage play "Peter Pan". This is written and directed by Chris Martinez using the large influence of the music of APO Hiking Society, adding the subtitle "I Do Bidoo Bidoo, Heto nAPO sila". 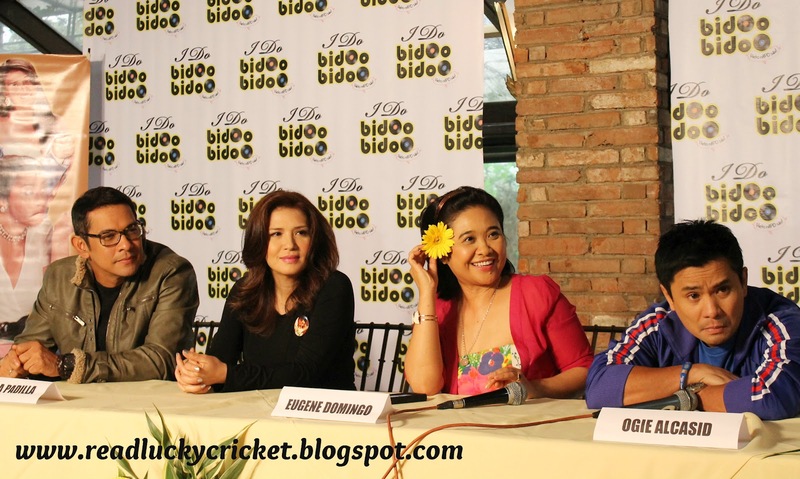 The movie will open in cinemas nationwide on August 29, 2012. For Zsa Zsa Padilla, who is currently rebounding from the loss of the love of her life, Comedy King Dolphy, doing the movie was a joy as she can do both acting and singing- two fields she love the most. Though she was apologetic for contributing some of the reasons for the film's delay, she chose on sticking with the movie despite the challenges she underwent lately. "I could not let it go. 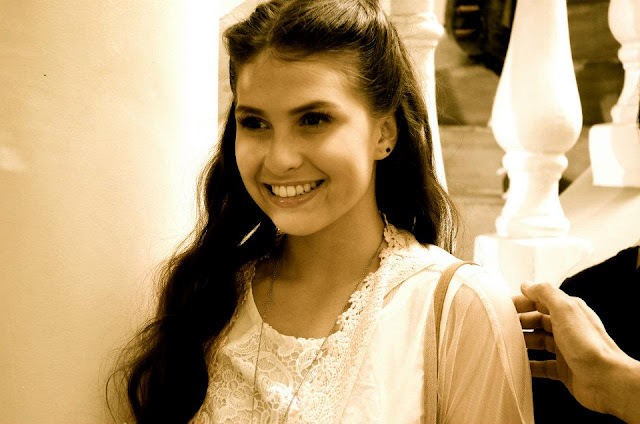 Besides Direk Chris told me my role was tailor-made for me", the Divine Diva said with a smile. Gary Valenciano and Ogie Alcasid, meanwhile, shared the same passion for music that they found an excellent outlet through the film. 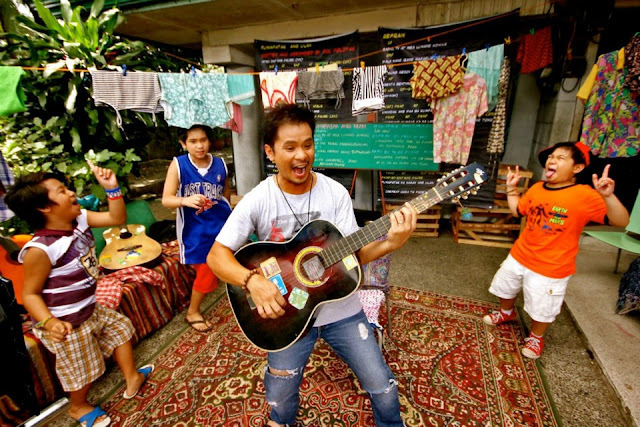 "Seventeen of the best APO tunes. 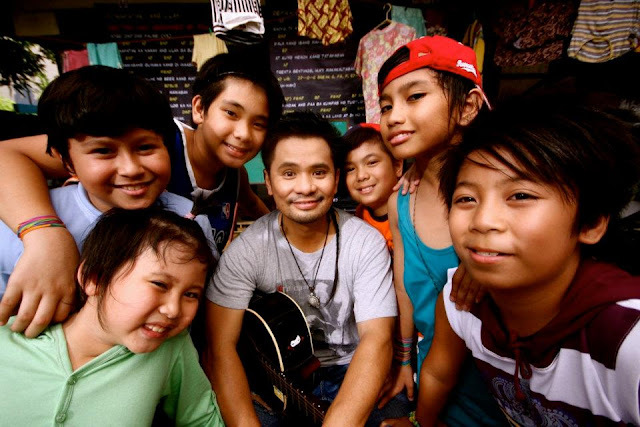 It was such an honor to perform all those in this movie", Alcasid proclaimed. For Gary V, it was just a sheer joy to be back in the big screen again. Director Chris Martinez, meanwhile, revealed that it took 2 days in average to complete and record all 17 APO tracks and production that were done for the movie. "Pa-Broadway musical ang peg nito. Makapal ang sound and talagang masasabi na pinaghirapan", Martinez shared. Vincent de Jesus, the musical director of the film, also stayed faithful to the original melody of the APO songs. "We stayed to the melody para naman masabayan ng mga tao sa sinehan", Martinez added. By the looks of it, this is a huge comeback of the musical genre to the big screen. On August 29, let's sing along inside the movie house with everyone in the family, shall we?